Before we talk specifically about the Moon in Pisces, let’s talk about the Moon for a moment. Astrologers consider the Moon a planet, and it’s the fastest moving of all of them. Because it moves so quickly, the Moon passes through each of the 12 zodiac signs once every month. Just as the Sun has a placement in our birth chart, so does the Moon. 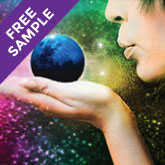 You can use our free Cosmic Profile to reveal what your natal Moon sign is. Knowing your lunar sign helps you understand things like your true inner nature, your Moon sign compatibility, and more! 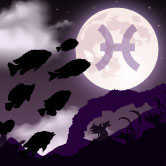 No matter what Sun sign you are, for a couple of days a month we all feel a little bit like a Pisces. 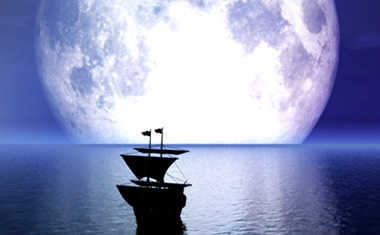 When the Moon is in the whimsical sign of Pisces, you’ll find yourself drifting and dreaming. Forget that pressured series of events in your day planner, and don’t bother checking your watch. This lunation will have you more concerned with the thoughts that are dancing through your mind than the realities of your everyday life. Your intuition will be heightened, and you’ll accomplish more by letting your instincts guide you. Because emotions are on overdrive during the Pisces Moon, you’ll have a sensitivity and receptivity to the world around you. This will be a time when you’ll feel sentimental, and wanting to connect with your loved ones in an effort to be closer to them. Don’t be surprised if you get a little misty during television commercials -- this is just how this Moon affects us. 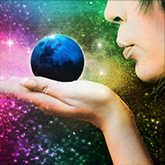 New Moons are always a time of new beginnings, and the New Moon in Pisces inspires us to imagine the future we want. Write down what it is you’ve been dreaming of and what’s stopping you from getting it. This is the time when we overcome our fears so that we can begin manifesting the things we’ve fantasized about. The Pisces New Moon is also a period of profound healing. If you’ve been wounded emotionally or spiritually, this is when you will focus on your regrets, your anger, your insecurities, and your doubts. This is a good time to meditate or take a walk. These moments of solitude will allow you to go within and reconnect with yourself so you can patch up old wounds that have been lingering. The Pisces Full Moon is a time of compassion. When the empathy of the Pisces Moon combines with the skills of the opposing Virgo Sun, we truly have the best of both worlds. What these signs have common is a sense of service. This Full Moon reminds us that we don’t have to be precise to be helpful, and that making an error with a loving attitude is sometimes more beneficial than perfect behavior done begrudgingly. 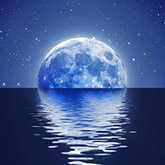 The Full Moon in Pisces turns our simple thoughts into vivid fantasies. We might feel like we’re in a cosmic tug of war where we’re being pulled between idealism and reality. It may seem as though we’re being forced to choose sides, but the point of this lunation is to put ideals and inspiration into concrete forms so we can bring our dreams down to earth. Those born with their Moon in Pisces, also called a natal Moon in Pisces, are incredibly sensitive people that have been gifted with a sharp intuition. Their sixth sense is so strong that they often display psychic abilities, and are prone to having prophetic dreams and picking up on things around them that others might miss. Because of this, they trust their gut instincts and are known to act on hunches alone. 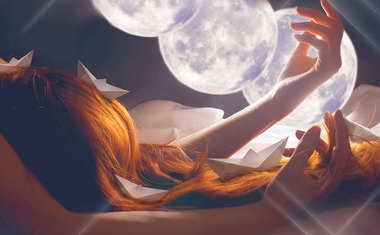 Romance and passion are vital for someone with a Pisces Moon, and they often dream about having the kind of fairytale romances we read about in books. This makes it easy for them to unconditionally accept the ones they love and always see the best in them. They can get caught up viewing others through rose-colored glasses, but when they learn how to temper that with the realities of who someone really is, they experience a sublime kind of love. Lunar Pisceans are highly creative individuals. This is due to the fact that they have a deep appreciation for beauty and wildly vivid imaginations. They’re incredible artists and will channel this gift into various art forms. Artistic expression is important for Pisces because it also acts as a form of escapism, helping them recharge their spiritual batteries.